Almost every book about the Vikings includes photographs of warriors found on early medieval carved stones from Britain, Ireland and the Isle of Man. How do we interpret these images? Why were figures with weapons and armour depicted on carved stones at this particular time, and why were they posed in certain ways? This talk suggests new ways of interpreting warrior figures on commemorative stone sculptures from the tenth and early eleventh-centuries. 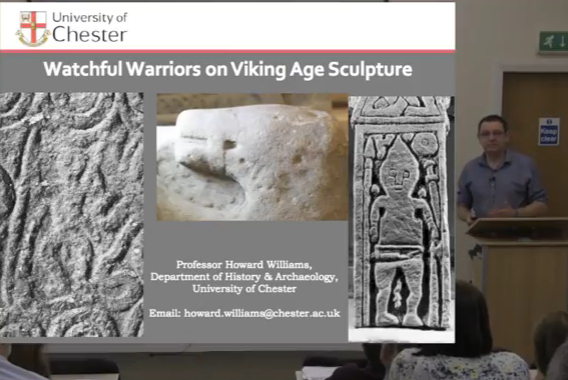 Prof. Williams will explore images of warriors on carved stones from across the Viking world, focusing particularly on stone sculpture from northern England and North Wales. A number of crosses from Middleton in Yorkshire have images of warriors in helmets on their shafts. In North Wales, a cross at Maen Achwyfan in Flintshire shows two weapon-bearing figures fighting snakes on the eastern and southern faces of the shaft. This cross is unusual in that one of the warriors may be depicted naked. Both the Middleton crosses and the cross at Maen Achwyfan have been dated to the tenth century AD. The Isle of Man has around 200 medieval sculptured stones, dating from the sixth to the thirteenth centuries. Some of them have Ogham, Latin, or runic inscriptions. On Joalf’s Cross in Kirk Michael, a warrior figure holding a spear and a small round shield appears above the runic inscription on the edge of the Cross. The inscription reads “Joalf, son of Thorolf the Red, raised this cross in memory of Fritha, his mother”. The cross was probably carved around 950-975 AD. This lecture will suggest how these carved stone warriors might have commemorated lordly power and authority during the Viking Age, as well as asserting an armoured identity for the afterlife. With this in mind, Prof. Williams will propose that these warriors might be seen as animated ‘watchers’, standing sentinel over those who are being commemorated. Could the image of the warrior on Joalf’s Cross represent Joalf himself, keeping watch over his mother?